So, I have a young son and, sometimes, he's kind of a mystery to me. With my daughter, I knew what I was getting into. Not only did I used to be a little girl, but I have several nieces who I've seen through childhood (I do also have a nephew, but he grew up far from us and we only saw him a couple of times a year). When I found this book, I thought it might shed some light on what was going on with my little guy. And, yes, it did shed some light for me. 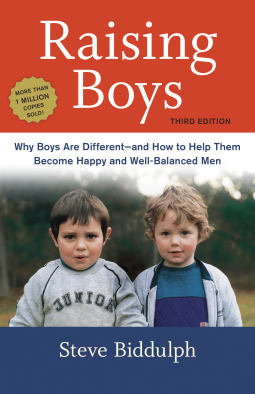 Biddulph goes through biological, mental, social, and emotional development of boys. I will say that there wasn't anything that was surprising about the social or emotional development sections, but I did learn quite a bit about biological development of young boys--things that are demystifying my son. Biddulph also includes a number of "Stories from the Heart" to illustrate some of his points. These vary in usefulness. Some are very enlightening, but some seem rather unneeded or incomplete. Still, I didn't feel that even the least effective of these negatively impacted my experience with this book. I will admit that this is the first parenting book I've read that focuses on boys. I can't compare it to any other work out there. I can, however, say that this book was of value to me as a parent of a son and I would recommend it to other parents. I received an electronic copy of this book to read in return for an honest review. I received no other compensation for this post.